I could spend hours trawling through various interior and style blogs and Pinterest, looking for inspiration and mentally planning what my future house will look like. So, I’ve compiled a list of the top 25 interior blogs – hoping that each one will give you some kind of inspiration and ideas. Written by Sian whose talents and knowledge include property renovating, self-building, interior designing, and TV presenting (to name a few). 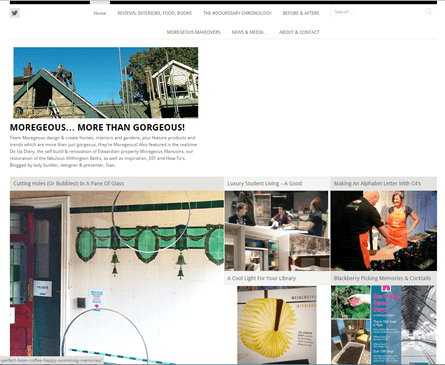 Moregeous is an informative and fun read, bringing design inspiration, the latest trends, practical advice and various musings. Sian has been nicknamed as a ‘lady builder’ which is one of the many reasons why I love reading her blog – it’s great to see a woman offer practical and concise building advice on a platform that is so helpful and easy to understand. Bright Bazaar Blog is unlike no other, with a huge focus on all things bright and colourful, author Will shares his unique perspective on design and style – following his personal motto that ‘beige is boring’ and taking inspiration from his daily life and travels. The way Will can seek out colour and draw on this to provide inspiration for interiors is amazing. He also has a best-selling design book under his belt and a second world-wide book deal is on its way so it’s easy to see why Bright Bazaar Blog made it to my top list! What I love about Kate’s blog is that the content type differs daily. The blog prides itself on three aspects ‘design and décor’, ‘food and travel’ and ‘fashion & style’ as Kate shares style inspiration for the home, new product launches and information and insight into Kate’s life. I could spend hours on the beautifully designed website, and am always left feeling inspired. Of course the ultimate style-guru Abigail, had to make our list of top interior bloggers. Recognised world-wide, Abigail is a definite trend-setter known for her eclectic yet enchanting style and taste. Her blog is full with lots of tips and tricks that can be used in your home. I love the coolness of Abigail’s style showcased on her blog and the fact that small things (e.g. small faux plants) can go a long way in revamping your home. Writer Samantha likes to blog about interior styles and spaces and also dabbles in food, DIY and photography. The blog overall has a mood board-like feel to it, where it showcases Samantha’s latest inspirations and style trends – the posts are brief yet easy on the high due to the highly visual layout. Kate started this blog to document her experience buying and renovating her house to become something she was proud to live in. She offers advice on the things she has learnt along the way and offers posts with design and style inspiration at an affordable price. Your Home is Lovely was a definite for my top list as the information and inspiration Kate offers is accessible for everyone, no matter your budget. As people are become more conscious of the environment and re-using old items, Upcyclist delves into creative and innovative upcycling ideas from people around the world with items considered unwanted or useless. I think the possibility of repurposing unwanted items to something usable is amazing and Upcyclist offers so many great ideas to get inspired and get upcycling. Blogger Anna targets which will resonate with most people, as at some point we’ve lived in rented accommodation where we are limited in making any changes. Anna offers handy hints, tips and ideas into transforming your home space with various limitations. I’ve included Don’t Cramp My Style into my top list as its one of a few that targets a younger audience and I love Anna’s ideas, there’s so many that I want to try for myself! Natalia writes British Style UK, and is an advocate of championing British style in interiors and design. Her blog showcases this as she provides inspiration, DIY tips, product reviews and other various lifestyle elements. Her blog is a great and informative read and I absolutely love that Natalia embraces and supports British style when it comes to interiors. Jen Stanbrook hopes to inspire people in the world of interior design that are often intimidated by it – I think she does just this with Love Chic Living. The award-winning blog offers affordable ideas to transform your home, with ‘how to’ posts to product reviews and style/design focussed mood boards, Jen creates a comfortable environment for users to gain ideas and I love how Jen’s eye for modern / contemporary design is apparent from the outset. This ethos of Design Hunter is one that I love – the blog believes that the items we introduce into our lives should help to create a home that is ‘inviting, restful and a place of sanctuary’. Author Helen, covers various aspects to her blog but has a focus on luxury and modernity. We all love a bit of luxury and Design Hunter is a great platform to find just that for our home. Although not strictly an interiors blog, Wild & Grizzly has a great interiors section which fits in well with Lori’s wider blog. Lori provides lots of advice, reviews and inspiration surrounding living in a family environment. I absolutely love the style Lori portrays in her posts and always find them enjoyable to read. The woman behind the blog, Karine likes to mix vintage, designer and high street items to create her personal ‘effortlessly-chic’ style. The interiors section of Bodie and Fou can be easily navigated to suit your needs depending on the room you’re looking for that extra bit of help, from kids bedrooms to kitchens and bathrooms. Karine features various designers and retailers aswell as providing lots of hints and tips. I just wish I had the same eye for detail as Karine! I just love Kimberley’s sense of style in the world of interior style and design which is why Swoonworthy had to make the list. Describing her own style as ‘eclectic boho glam’ – you’ll often find bold patterns (including animal print), gold finishes and various textures featured across Kimberley’s blog. Another reason, Swoonworthy has made the list as a top interior blog is due to her belief in creating strong stylish homes without spending lots of money. Decorenvy is the perfect destination for all things NOT high street, featuring lots of retailers and designers to enhance your own personal and individual stamp in your home. The blog was established to become a hub to find unusual and quirky designs when you want to avoid the high street, and avoid your home looking the same as many others. Decorenvy does just this and offers interiors ideas, tours of unique homes, and DIY ideas too. Amanda uses her blog to document her various passions including interiors and design. Drawing on from personal experience, Amanda provides down-to-earth and honest advice, from designing a children’s room, to planning a Kitchen. She also showcases must-have products and also offers her opinion in the world of interiors. The Ana Mum Diary is always an interesting and fun read and I recommend it to anyone looking for ideas of where to start when it comes to designing your home. For anyone that loves a bit of crafts and DIY, The Lovely Drawer is a must visit. Blogger Terri likes to share her creative ideas with her readers, with lots of ‘how to’ posts to keep you occupied, Terri makes the cutest items that look amazing in the home. Terri also blogs mood board style posts to ensure her readers are kept up to date with the latest home trends and styles. I love Terri’s simplicity in her design inspiration and will definitely be making some of Terri’s craft ideas asap for my flat asap! Little House on the Corner was created to allow bloggers, Jan and Christine to document the progress of the renovation of their first house. What I love about Little House on The Corner is the great DIY ideas to make the most of your home in terms of its design, space and interiors. It’s great to see the before and after shots of the rooms undergoing renovation in their house and is a definite source of inspiration for those undergoing the same process. The first time I came across Moon to Moon, I was drawn to the boho style that Gabi portrays across her blog. Gabi features various houses in her posts, showcasing eclectic bohemian tastes from around the world. Gabi also provides product ideas and suggests various retailers to help readers feel inspired to implement a bohemian feel into their homes. If you’re looking for interiors ideas and inspiration for your home, Fresh Design Blog needs to be on your list. The blog profiles the best contemporary and modern products and design ideas whilst providing lots of information in the design process of your home. The ideas posted are all affordable, accessible and on-trend. Author of Kat Got the Cream, Kathryn uses her blog to share her favourite finds, creative projects and personal style in the world of interior design. Kathryn uses these aspects to provide styling tips, introduce new products / companies of interest to her readers, and inspiration boards. 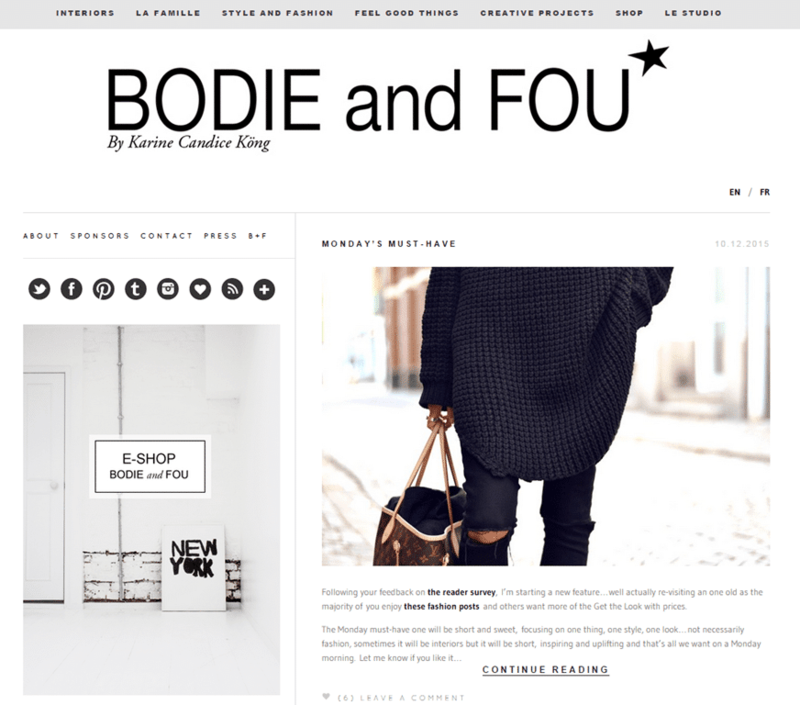 I love the style that Kat incorporates into her post and whenever I visit, there’s always a new brand I discover! Hello Peagreen was launched as an online scrapbook to celebrate the ‘ordinary and the extraordinary’ in interior design, a place to stay ahead of the latest trends, showcase the possibilities of introducing vintage to your home and where to find them as well as being a platform to introduce new inspirations to the Hello Peagreen readers. The blog is definitely a must visit and my favourite posts are Mary’s visits to various exhibitions / places and how they also draw in as inspiration too (e.g. LD14 Highlights – Curiosity Cloud, I love the idea of floating bulb/globes for the home). I’ve long admired The Design Shepherd, and has been one of my favourite interiors blogs for a while. It’s a definite go-to website for a reliable source for all things interiors. Author Stacey often provides round-ups of the latest interior news and product launches, offers trusted product reviews, and other various inspiration posts (e.g. lust lists and pinspiration posts to name a couple). 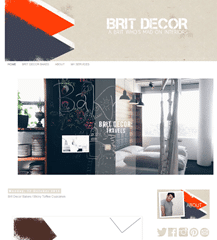 Again, I love anyone that incorporates British Style and Mike Ahern does just this on his blog Brit Décor. Mike mainly focuses on interiors in the UK and keeps his own ‘black book’ of retailers so he can make design and décor more accessible. 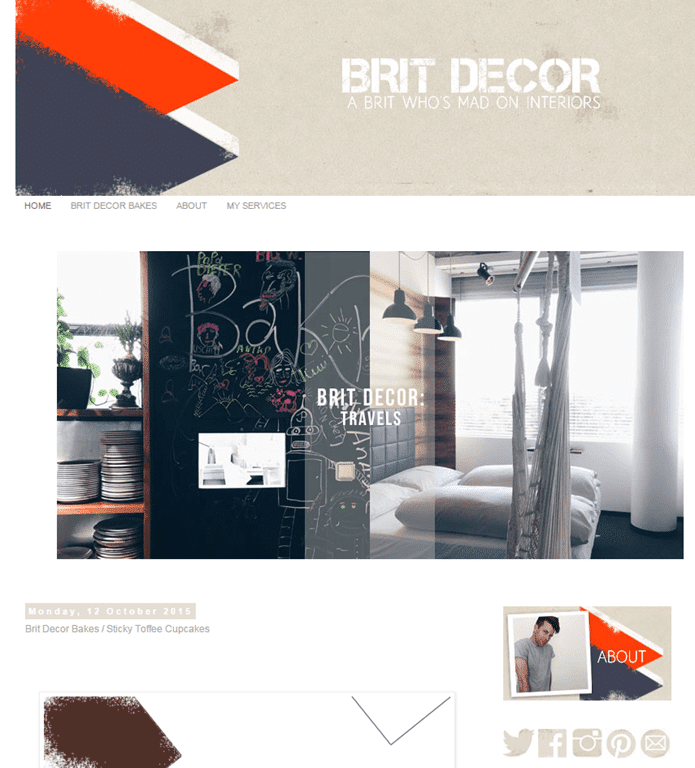 Brit Décor is a great blog to be kept up to date with the latest trends and I love Mike’s minimalistic approach to design and the way in which he incorporates colour and in his inspirations. Patterns are a massive part of any interior inspiration and this blog understands that and brings you the best patterns to work with. Working them into a variety or environments it makes print and pattern look good in any room. Print & Pattern is bold and in your face and I love that about the blog. Hopefully, you’ll love these blogs as much as we do and can draw on various inspirations and ideas for your own home. Here at Prohibition, we are fascinated by the world of homes and interiors, which is supported by our client roster and the fact we launched First Home News. If you think there is a blog that should be added to this list, feel free to leave a comment with details of the site. #HelloNetto – Tasty Pastry Anyone? Many thanks for the inclusion in your list!